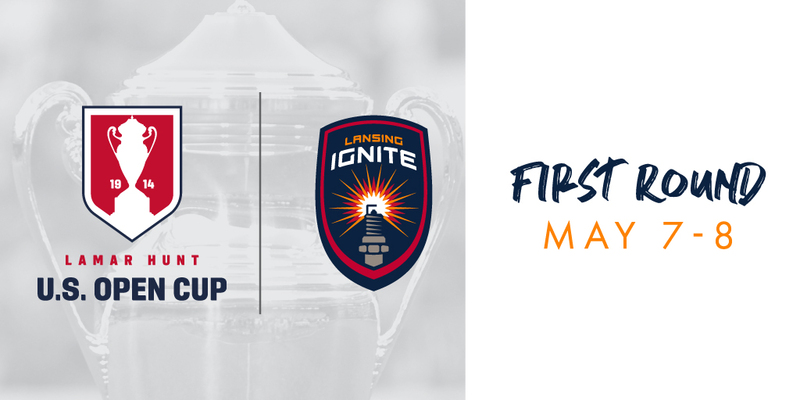 LANSING, Mich. – The U.S. Soccer Federation announced today it had finalized the format and schedule for the 106th edition of the Lamar Hunt U.S. Open Cup, which will see Lansing Ignite FC kick off in the First Round of the competition from May 7-8. In total, the 2019 tournament will feature a total of 84 teams from all levels, culminating in August with America’s soccer champion lifting the Open Cup trophy after eight rounds of single-elimination play. LIFC will join the First Round alongside a total of 32 Open Division teams (clubs from USL League Two, the National Premier Soccer League, those advancing from four rounds of local qualifying played between September 2018 and April 2019 and the 2018 U.S. Adult Soccer Association National Amateur Cup champion Bavarian SC from Milwaukee, Wisconsin) and five eligible USL League One clubs, which includes Forward Madison FC, Greenville Triumph SC, South Georgia Tormenta FC, Chattanooga Red Wolves SC and the Richmond Kickers. Ignite FC will learn its opponent when the First Round pairings are announced on April 10, while the potential Second Round pairings and possible pairings will be revealed on April 17. Home teams will be determined by random selection among those who apply to host. Clubs whose venue meets minimum tournament standards will be given priority. Should LIFC be chosen to host the First Round match, the game would be played at Cooley Law School Stadium. Single-game tickets would be made available in mid-to-late-April, with Ignite FC season ticket holders having a pre-sale opportunity to secure their tickets. Twenty-five teams from the newly-renamed professional Division II USL Championship will take the field starting in the Second Round on May 14-15, while the Third Round takes place on May 29. Its winners will be joined by the 21 U.S.-based Division I Major League Soccer clubs in the Fourth Round on June 12. For more information on the U.S. Open Cup, visit ussoccer.com.